USA soccer suffered a fatal blow in a loss to Ghana to end their 2010 World Cup dreams, but looking back on the tournament USA soccer will now be looked upon in a different light, one with respect and dignity. So if you’re one for looking on the brighter side of things, there’s that. 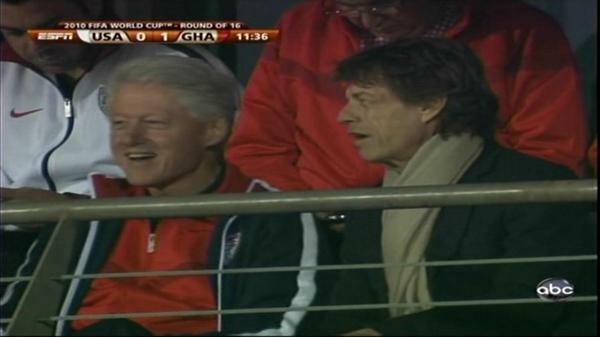 Former President Bill Clinton was present just as he was for the USA’s epic win over Algeria, and was accompanied by none other than rock star Mick Jagger of the Rolling Stones. The camera showed Clinton and Jagger multiple times, but apparently Lakers star and NBA Finals MVP Kobe Bryant was more conspicuous. Other notable people who were there that I know of are CBS broadcaster Katie Couric and Phoenix Suns guard Jason Richardson, although I’m sure there was an overload on non camera-shy celebrities. You’ve already seen Drake bring out this year’s NBA MVP LeBron James onstage at a concert in Cleveland, and now the rapper has given five-time NBA champion Kobe Bryant the same honor in Anaheim. After the Lakers championship this season Kobe is one short of Michael Jordan’s six, although I’m not sure if MJ ever got to go onstage at a rap concert or go on Jimmy Kimmel Live. Kobe addresses the crowd right before Drake performs the song “Over”. Just think if the Celtics won the championship that could have been Brian Scalabrine onstage. Comedy Central provides many things, and one of them is the show “Tosh.0”, hosted by Daniel Tosh. The show normally makes fun of videos that have hit the internet, although recently Tosh went after the Boston Celtics’ Paul Pierce. Tosh isn’t much of a NBA analyst, but that doesn’t keep him from giving the gift of laughter. As the Lakers cruise through the Western Conference Finals, Kobe Bryant appeared on the latest episode of the ABC sitcom Modern Family. The cameo is rather short, but Kobe didn’t exactly take a lot of time out of his schedule to shoot it. The part was filmed after the Lakers 122-99 victory over the Indiana Pacers on March 5. I love how they chose to film the part after a game against one of the NBA’s lesser teams. I guess you can’t take a chance on the Lake Show losing and subsequently a rather upset Mamba. When talking about the best player in the NBA, the first thought to pop up in your mind is Kobe Bryant vs. LeBron James. Everyone has bought into this matchup, as it pits the supposed two best players in the league against each other. When discussing the MVP race Bryant and James’ spots are presumably set in stone at the top of the list. Is there anyone else deserving? And even if there is, how on earth could they possibly surpass these two seemingly immortal superstars? Enter Kevin Durant. Going into the 2006-07 college basketball season he was ranked as the number two recruit behind big man Greg Oden. He went on to become the first freshman to win the player of the year award in college basketball, and decided to take his game to the next level. Even after his record-setting season in college basketball he still was not considered the best player available in the 2007 NBA Draft, and was taken second by the Seattle Supersonics, yet again behind Greg Oden.The Sonics decided to prepare for the future by trading their two best players, Ray Allen and Rashard Lewis, for draft picks, and took fellow college All-American Jeff Green. Durant inherited a team that went 31-51 the previous season, and would hit the ground running as the go-to guy his rookie season. He led all rookies in scoring that year, averaging 20 points per game and winning the rookie of the year award. The Sonics finished 20-62 in Durant’s debut season, which was the second worst record in the league. Durant’s sophomore season was just as rough as his rookie season. The Sonics decided to move to the state of Oklahoma, and were renamed the Oklahoma City Thunder. They drafted point guard Russell Westbrook fourth overall, in hope of giving Durant some much needed help, and his scoring average jumped up to 25 points per game. The Thunder finished 23-59, although this time it was only the fourth worst record in the NBA. By this time as Durant entered his third season in the NBA the Thunder weren’t even as much as an afterthought in the minds of NBA analysts, but third time’s the charm, right? They were starting to get the pieces together, but people questioned whether or not Durant could carry a team as young and inexperienced as the Thunder. Many “experts” said that the Thunder’s time would come, but this was not the year. The talent and depth in the Western Conference was just too strong, and the Thunder would return to their role of cellar-dweller. The Thunder won their first two games of the season, and took the defending champion Lakers to overtime in just the fourth game of the season. Even though they lost, they showed they had what it took to become a threat in the Western Conference this season. They now sit at 37-24, good enough for the sixth seed in the Western Conference playoffs if they started today. The Thunder are also doing well away from home, with a 18-13 record on the road, the true sign of a “veteran” and experienced team. Durant is averaging nearly 30 points per game, barely trailing LeBron for the scoring title. He became only the third player over the last thirty years to score 25 points or more in 25 consecutive games. In less than three years he has almost single-handedly transformed the worst NBA franchise into a playoff team, and a championship contender at that. Kevin Durant’s name may not be LeBron James or Kobe Bryant, but he is quickly showing that he is the “Most Valuable Player” in the NBA. Follow Colin Means on Twitter.